These visiting representatives of those thousands were among the most heavily used types--the Boeing B-29 Superfortress, that carried our air war to the Japanes homeland, the North American B-25 Mitchell, that harried the enemy in all theaters of the war, and the Curtiss SB2C Helldiver, that took over Navy carrier bomber operations from the aging Douglas SBD Dauntless, the hero of the Battle of Midway. 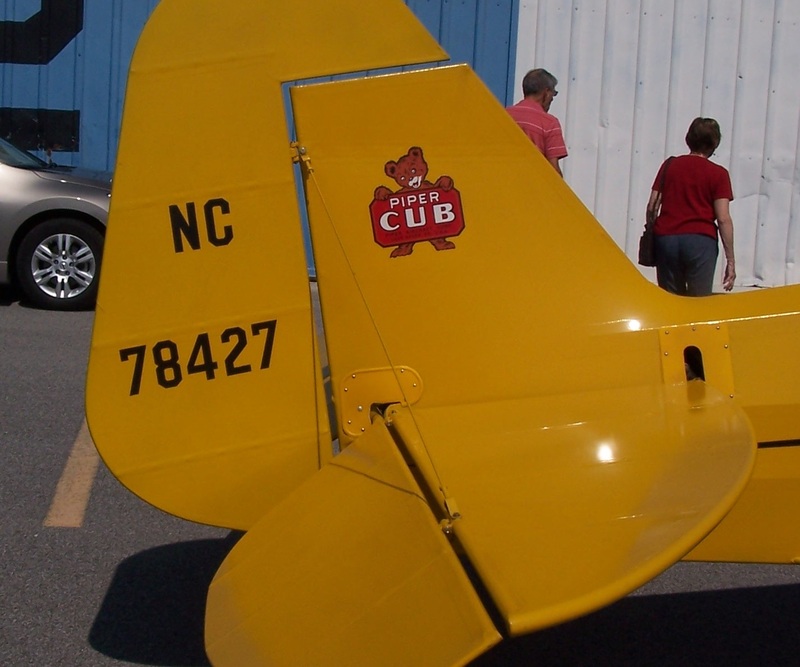 I would like to point out the Piper J-3 Cub that is so familiar to us model builders and flyers. It, too, served in WW II and not only in the modified form of the famous L-4 Grasshopper, but in training capacities all over the country before and during the war. 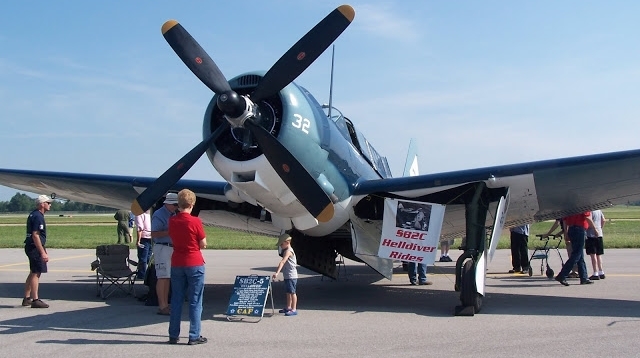 You can find a very good set of info on this historic airplane at www.answers.com. And that brings me to a personal story about how I first met this remarkable airplane. I call it "Fred's First Flight." My brother, six years older, earned his license through the Civil Pilot Training Program when war clouds had gathered over Europe. I think we're talking about 1938. As our preparation to defend ourselves if necessary proceeded, he became a CPTP instructor. The scene is north-central Ohio, a lovely day in July, CAVU I think they used to say. Task assigned: Deliver one J-3 to another of the manager's fields some distance south, maybe a couple of hours. Fine, up we go, fly along for a while, then, there's the destination, land routinely, gas the J-3 to be flown back and let's go. So, there we were when big bro noticed that little wire sticking up out of the gas tank was getting kinda short. Check the map, locate us. Hm-m! We ain't where we're s'posed to be. Do a 180, but then, on the way back, that little wire got just too short. Better put 'er down. Lotsa abrupt hills in that part of Ohio, but lotsa nice open fields, too, even if some have wheat or something. Let's take that one right down there. Slide slip right, then left once or twice, line 'er up, push up over that barbed wire fence and bump-a-bumpa, rumble-rumble. 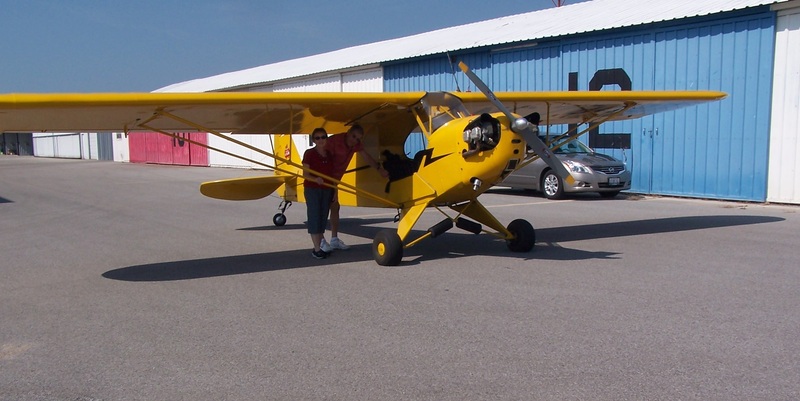 Prop stops, we get out, he goes to the farmer's house, calls the field, they come with gas, put some in, he gets in the airplane, I get in the truck, we meet at the field, gas 'er up, start again and home soon. I was not a bold kid, but I felt no fear, no anxiety, at all through that whole adventure. That's not a boast, but a reflection on how we grow and develop. I had no reason to know fear. I was a dumb kid. I still recall vividly the appearance of a cornfield below as he did the slip-slide maneuver. Not even that skeert me. The later afternoon sun was making distinct corn shadows curled by the wind. I felt nothing, not even seat-of-my-pants sensations, but I was surprised when I turned my head to look out to realize that I was looking down at the ground, not out across the fields. But I did feel kinda uncertain in that biplane over Maui years later. Older, then, maybe wiser, but still with a long way to go to maturity and it's a long road.